Installing gutters is a simple process involving cutting and fastening aluminum shafts to fit the contours of a home or building. Shaping gutters around corners is often the most challenging part of an installation. Since most corners are 45 degrees, knowing how to fit gutters at 45 degrees is an invaluable skill. With a few basic tools and safety gear the job of working aluminum gutters around corners can be done by almost anyone. Working gutters around corners often requires 45 degree angles. Measure the length of the wall where the gutter will be installed and leave an extra 8 inches of material on the end for the 45 degree angle. Cut your gutter material to fit the required length using either a hack saw or metal snips. Attach the gutters to the outer wall of the building using a screw or nail gun to place fasteners to the tops or sides of the gutter. Do not install fasteners near the bottom of the gutter or holes and leaks could develop in the future. Press together both angle-cut corners of the gutter and join them by injecting waterproof silicone sealant into the seam. Spread a heavy layer of silicone sealant along the top of the seam with your fingers while wearing latex gloves. When dry the sealant will provide a solid waterproof joint. 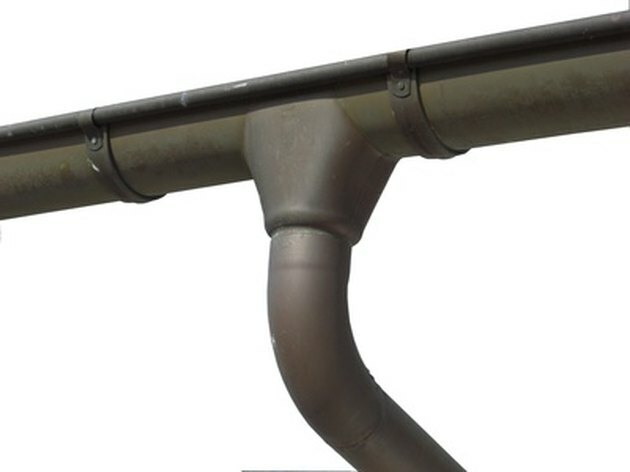 Test the joint by running a garden hose into the gutter and watching from below for leaks at the corners.